These cupcakes are so simple and so delicious. 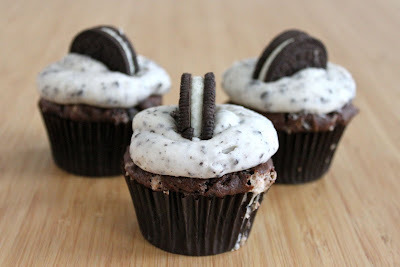 Just about everybody I know loves Oreos which means just about everybody would love these cupcakes. All you have to do is mix in chopped Oreos into your favorite chocolate cake recipe. 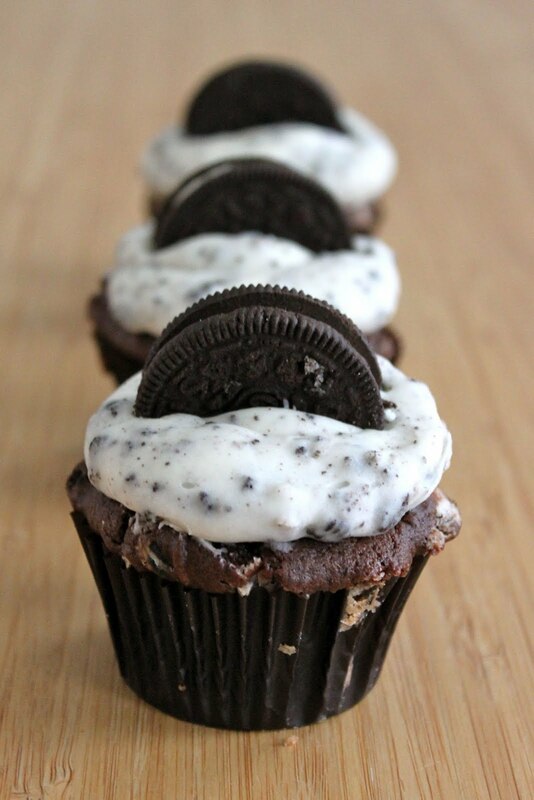 I like to use one Oreo per cupcake. Most cake recipes make 24 cupcakes, so you just need to roughly chop 24 Oreos and gently stir them into your cake batter. This time around I used my favorite quick Chocolate Cake recipe which uses a mix and they turned out just as delicious as when I make this recipe from scratch. That being said, it is completely up to you which cake recipe to use. I have also made these cupcakes using my Sugar Cookie Cupcake recipe and really loved them, but the chocolate took first place. Now the frosting is truly delicious. I may have eaten quite a bit straight from the bowl. I want to spread this frosting on everything. Seriously, I am looking for any excuse to make this frosting. I topped each cupcake with half an Oreo which is completely optional. Preheat oven to 350 degrees Fahrenheit. Line 24 muffin cups with paper liners. In a large bowl, mix together the cake and pudding mix, sour cream, oil, vanilla extract, eggs, and water. Gently stir in the Oreos and divide batter into 24 lined muffin cups. Beat butter and cream cheese with until fluffy, 2 to 3 minutes. Slowly add sugar, 1 cup at a time. Add salt and vanilla; mix until smooth. Place Oreo cookies in a fine strainer to remove any small particles. Gently stir Oreos into the frosting, careful to not over stir. Frost cupcakes as desired. Store any remaining frosting in the fridge.